The unusual properties and abilities of some Archaea have earned them the title of “extremophile”, and scientists are still working to understand them. Surely no organism can survive, even flourish, in boiling water or liquids ten times the salinity of seawater, or live in the deep coldness of the ocean floor under tremendous pressures. And a microbe that loves to eat oil accidently leaked by massive oil tankers must be science fiction. Wrong – some microbes within a classification called Archaea (ar-kay-ah) have evolved adaptations to extreme environments, leading scientists to speculate that such microbes might be able to survive on or in other planets or moons in our solar system. Many people think that microbes are disease-causing organisms that should be eradicated. Alcohol hand sanitisers are popular in homes, schools, doctors’ offices and grocery stores, and antibacterial soaps and dishwashing detergents are designed to kill some of these “dangerous” organisms. Some microbes are parasitic and disease-causing. A fungus causes the itching of athlete’s foot, amoeba can threaten lives by causing dysentery (severe diarrhoea), and various types of bacteria can result in infections both inside and on the body. Some live in undercooked or raw foods, ready to cause misery. However, only a minority of microbes are pathogens (microscopic carriers of disease). For every plague bacillus or burger bug, there are millions of other kinds of microbes that are harmless to humans. In reality, most microbes and humans have a symbiotic partnership – they help each other. Bacteria devour our dead skin cells and help create a healthy environment within our digestive system (as our “gut flora”). Without them we’d have no cheese, yoghurt, wine, pickles or sauerkraut, or other fermented foods. They help in the decay of things that have died and in the cleansing of our atmosphere. Bacteria are used to create environmentally safe pesticides, antibodies to fight or prevent disease, and are even used in the production of synthetic insulin. We, and many foods we eat, provide the perfect environment in which they can flourish: comfortable temperatures, high humidity (in our mouths etc.) and food proteins and carbohydrates. 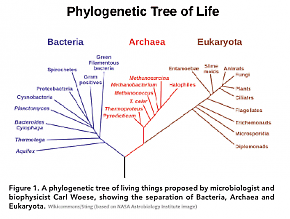 Archaea are the only microbes that have no known pathogens. Despite their abundance, they are not part of any food cycle. An archaeon is as different from a bacterium as either is from a human. 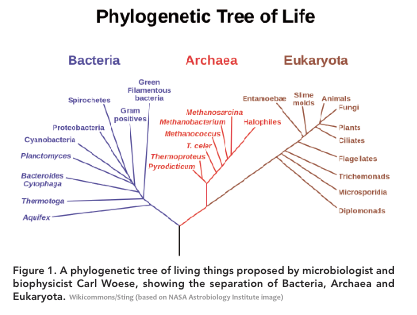 Bacteria and Archaea often look much the same. Both are unicellular. Neither has a nucleus or well-formed cellular organelles on the level that eukaryotes (such as animals or plants) have. Like most bacteria, Archaea have a variety of shapes, but unlike bacteria they can be shaped like triangles, discs, plates and cups. Archaea were first identified in 1977 but for these reasons were classified as just another type of bacteria. Today, nearly all microbiologists classify Archaea in a domain of their own, one of three known on Earth (Fig. 1). Scientists have concluded that Archaea are far more interesting – and valuable to us – than your average bacteria. They are now among the most studied microorganisms for their value in medicine, industry and bioremediation (the use of microbes to reduce, for example, oil spills and greenhouse gases). Archaea rank among the oldest forms of life on Earth. Some scientists think these microbes are similar to the original ancestors of all modern life. Somehow these microbes have learned to accumulate certain amino acids, salts, sugars and even some acids in their cytoplasm, and have developed unusually tough cellular walls, all of which help protect them from different kinds of outer stress and even virulent diseases that try to attack them. They can, however, be eaten by other microorganisms. Another unusual feature of Archaea is that they perform the key ecosystem service of nitrogen cycling, the main mechanism by which marine methane is kept out of the Earth’s atmosphere. It turns out that water-bound methane gas is one of their favourite foods, and when eliminated by the microbe, the gas is neutralised. If such a microbe did not exist, the Earth’s atmosphere would no doubt be unsuitable for humans. It’s not difficult to understand why Archaea are of such great interest to scientists around the world. Some Archaea have developed a different method of photosynthesis, a process by which they create their own food. Unlike photosynthesis in plants, Archaea have no need for the green pigment called chlorophyll. They use energy in the form of heat or chemicals, instead of light, to make food. Most Archaea are anaerobic – they can live without oxygen. This explains how they can survive underwater, thriving next to heat vents on the ocean floor. Archaea also have the ability to withstand extremely high temperatures and tremendous pressures. In addition to the colonies found in and around deep-sea hot water vents under tremendous water pressure, Archaea are found deep in Arctic and Antarctic ice, the hot springs of national parks, oil wells, geysers, salty and sulfuric lakes, irradiated liquids, termite guts, cow stomachs, places without oxygen and even within our own bodies. One of the basic questions scientists have asked is whether Archaea could serve as a food source for higher-level animals. To help answer this, researchers fed Archaea to a group of worms. Other groups of worms were fed their usual diets, as well as spinach and rice. All groups of worms thrived on all of the food sources, growing at the same rate with equal amounts of kinetic energy. This demonstrated that it may be possible for Archaea to be harvested as food for multicellular animals in the future, thus helping to increase worldwide food production. The amazing ability of some Archaea to live and prosper in the most inhospitable places on the planet has captured the attention of scientists and the public alike, and research into these tiny wonders continues.